The F717 often attracts attention because about two-thirds of the camera is a massive (and possibly menacing looking) lens. The good news is that this a superbly sharp, all-glass 5x Carl Zeiss F2-2.4 Vario-Sonar with a focal range of 38-190mm (35mm equivalent). It has a 6-bladed diaphram for realistic depth of field throughout its 13-step range of f2 - f8. The auto focus range is 19.7 inches to infinity, the dedicated macro mode has a range of 0.8 to 19.7 inches. The auto focus system is a 5-zone AF, the focusing point can be automatically or manually selected. The focusing wheel on the front now operates the motorized zoom when not in manual focus mode. The direction (CW-CCW) of the zoom action is adjustable in the setup menu. The dedicated zoom control is on the side of the lens barrel. To use the manual focus, you flip the switch on the side of the lens and then turn the ring at the end of the lens barrel, the LCD (or EVF) image is magnified while the ring is being turned and the distance to the subject is displayed as well. The manual focusing ring's rate of adjustment is proportional and depends on whether you turn it slowly or quickly. Slow turns yield a fine amount of adjustment whereas a quick turn will give you a much courser (faster) adjustment from close to distant. Along the top front of the lens are two infrared illuminator LEDs, these are used by the exclusive Sony NightShot and NightFrame exposure modes. NightShot is the same as that found on most Sony camcorders and generates a green-tinted monochrome image in total darkness. Sony claims the NightShot mode is good from 0.3m to 4.5m but realistically I wouldn't try to photograph anything much beyond a couple of feet unless using an external Infrared illuminator. NightFrame uses the infrared illuminators to let you see and frame your subject in total darkness and then switches to regular color mode and uses the flash. This mode is highly useful and will be further explained on the next page. On the left side of the zoom lens we find the focus control for automatic or manual and the zoom lens control. It's now a slimmer, horizontally positioned rocker switch. The F707 had a large vertical rocker switch that was much closer to the end of the lens and we commented that it was ergonomically incorrect. Happy to report that the new rocker switch is in a more normal position for where your thumb tends to rest. It's a 2-position speed switch with good tactile feedback. If pressed halfway the zoom speed is slow, fully depressed it is fast. To the right is the AE lock button, the spot metering button, the white balance mode button and a one-push manual white balance button. The eyelevel viewfinder is an EVF (electronic viewfinder) with a diopter adjustment knob on the top. The "FINDER-LCD" switch to the right allows you to select the EVF or the color LCD as your viewfinder. 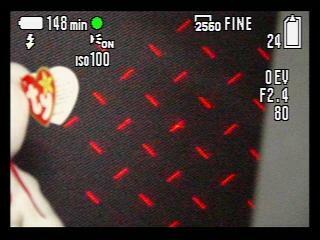 You can also use the EVF to review images and make menu selections, it shows the same information as the larger color LCD. The amount of information displayed is controlled by the DISPLAY button. As EVFs go I'd rate the F717's as a very good one. Some EVF displays are incapable of rendering the color of a scene and wash it out, the Sony EVF is high resolution and displays color very well. You can even navigate the menu with it which is very handy out in the bright sun. The intelligent, multimode flash pops up from the top of the lens automatically when needed unless you have the flash mode set to disabled. The F717 is one of but a few cameras to use true TTL (through the lens) flash control. Most cameras use a sensor mounted on the front of the camera and the exposure can be affected by strong reflections off of the subject or surrounding area. The flash range is 11.6 in. - 14.7 ft. (ISO set to Auto). Flash modes for Auto, On (Fill), Red-eye reduction and Off. And note that the flash accessory shoe is now a "hot shoe" with a standard center contact which will allow the use of 3rd party flash units. 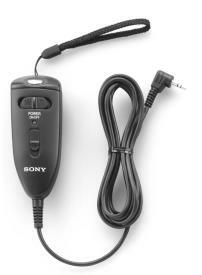 The Sony HVL-F1000 flash can be attached to the accessory shoe on the top, the sync cord plugs in to the port on the side of the lens. Besides giving you more flash power and range, the HVL-F1000 can be bounced for more natural looking illumination. Controls on the top: Mode dial with positions for Setup, Movie, Play, Auto, Program AE, Shutter speed priority, Aperture priority, Manual and Scene (Night, Night Portrait, Landscape or Portrait) modes. The power switch is built around the Mode Dial. On the front edge of the grip is the Jog Dial used to set shutter speeds, apertures and other things. You push it in and also turn it. The big silver button is the shutter release, next to that is the Exposure Compensation button, hold it down and turn the Jog Dial to set an EV override. Controls on the back: Display button controls information shown on EVF or LCD. The center button enables the thumbnail index mode or extended exposure information during playback. The MENU button calls up the onscreen menu system in Record or Play modes. The 4-way selector is used to navigate menus and control playback functions. When in record mode the 4-way is used to change the flash mode, macro mode and selftimer, the Quick Review feature is enabled by pressing it "left." Pressing it straight in accepts menu selections. The CHG indicator is both for the flash and when the camera is plugged into the battery charger. The FINDER / LCD switch controls the video signal to the EVF or LCD. Below the color LCD on the back is a small door that covers the AC charger jack and the A/V out port for the audio and video connection to a TV or VCR. The video out signal is user selectable for NTSC or PAL format. Sony appears to be the first to use the VERY fast USB 2.2 protocol for downloading and it is compliant with USB 1.1 devices also. The high-speed USB port is on the bottom of the lens, near the front. On the side of the handgrip is the combination battery and Memory Stick compartment. Sony includes a 32MB Memory Stick. Any size Memory Stick, MagicGate Memory Stick or Memory Stick Duo (in adapter) may be used. And now for the really good news -- the F717 can also use the new Memory Stick Pro memory cards with capacities of 256MB, 512MB and 1GB. Memory Stick Pro media will be available in spring 2003 from Sony, Lexar and Sandisk. Located in front of the Memory Stick is the battery. One of Sony's famous, intelligent and rechargeable batteries. The F717 is powered by the "M" series 7.2v 8Wh NP-FM50 InfoLITHIUM battery pack. Sony claims it is good for approx. 410 - 2560x1920 Fine mode still images (205 minutes) using either the EVF or color LCD. This is the -best- rechargeable battery system on the market. The NP-FM50 packs twice the power of the 3.6v 4Wh NP-FS11 used on the older F505/F505V. Also included is the AC-L10 combination battery charger and AC power supply which fully charges the battery pack in aprox. 150 minutes.